In social media, images have become the eye candy that draws readers to your blog and Facebook posts. If the image is one you created yourself, you’re good to go. But what about those times you can’t create your own images? Is it OK to just use that great picture you found on the internet? It’s safest to assume that all images on the web are copyrighted with all rights reserved, unless otherwise stated. That means you need to get permission for use from the image creator, or possibly face penalties ranging from a take-down notice, to a bill requesting payment for use of the image, to legal action against you. Not to mention – asking permission is moral and ethical. A number of artists and photographers, sometimes in an effort to generate notice for their work, have made their images available for use under Creative Commons (CC) licenses. The creator can put the image into the public domain (waiving all copyright), or retain some rights and choose from six licenses, ranging from simple attribution (permitting derivatives and commercial reuse, CC-BY), to allowing reuse as long as it is noncommercial and the work is not modified (CC-BY-NC-ND). This work, "CC Chart", is a derivative of slide 88 of “The OER 101 Workshop at USM II” by Zaid Alsagoff used under CC BY-NC-SA 2.5. ”CC Chart” is licensed under CC BY-NC-SA 2.5 by Amanda Pape. There are a number of tools available to help you find copyright-friendly images, such as Creative Commons Search and flickrCC. Recently, Google Image Search made finding such images much easier. 1. Enter your search term. 3. Click on Usage rights. 4. Select the appropriate license (“Not filtered by license” is the default). Images (if any) that fit the license restrictions will appear. Depending on your search terms and the license you choose, images may come from Flickr, Wikipedia or Wikimedia Commons, Pixabay, or the Open Clip Art library. 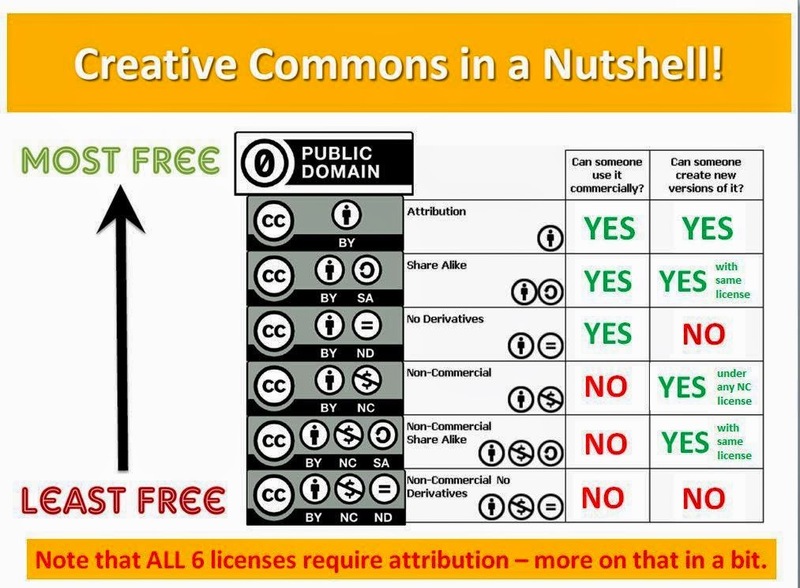 It’s important to note that ALL Creative Commons licenses require users to provide attribution to the creator. What is attribution? It’s the journalistic practice of crediting information to its source (so you know where something came from), and a concept in copyright law requiring acknowledgement of the creator of a work (such as an image) which is used or appears in another work (such as your blog or Facebook post). When using Creative Commons images, you must credit the photographers/artists in the manner they specify (if they do so). Sometimes you can find the preferred attribution with the image, or on a profile page from the website where you found the image. Cite the work’s title or name (and link it directly to source of the original work). Cite the author’s name, screen or real (and link to the author’s profile page when available). Cite the specific CC license the work is under (and link to the license deed on the CC website). Keep intact any copyright notices for the work. Indicate if the image has been modified or adapted by you in any way. If you use one of the citation tools mentioned above, take what it generates and fill in the missing pieces, as much as you can. Make some effort, just as you would in citing sources in a paper written for an assignment in school. The two images used in this blog post provide examples of proper attribution. Amanda Pape is the Coordinator for Archives and Special Services for the Tarleton State University Libraries. She regularly uses (and attributes!) Creative Commons images on her genealogy and family history blog, ABT UNK.